Last week, when looking at the latest weekly HSBC hedge fund performance report, we commented that while February was barely half-way done, it is already shaping up as the worst month in history for most quant, CTA and managed futures funds since the great quant blow up of August 2007. And not only: a quick look at the best and worst performers so far in 2018 shows a distinct skew to the downside, with the worst performing hedge fund down 25% in 2018 compared to the 14.5% return for the best. Using an updated set of HSBC P&L data, the FT reports that Man AHL’s $1.1bn Diversified fund lost almost 10% in the month to February 16, "while the London investment firm’s AHL Evolution and Alpha funds were down about 4-5% over the same period. The flagship funds of GAM’s Cantab Capital, Systematica and Winton lost 9.5%, 7.2% and 5.3% respectively between the start of the month and February 16." Other quants who got crushed include Aspect Capital’s Diversified Fund, down 9.5% MTD, while Lynx Asset Management's trend-following fund slumped 12.7%. A leveraged version of the same fund tumbled 18.8%, the FT adds. 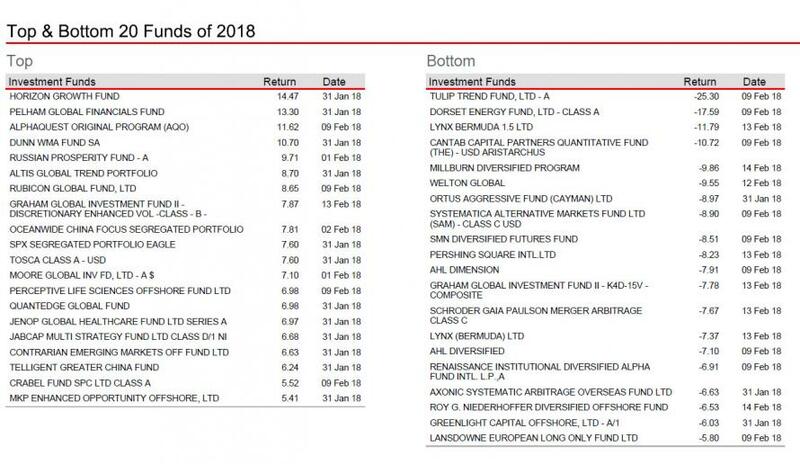 As we showed last week, one of the biggest victims was Roy Niederhoffer, whose fund lost 21.1% in the month to February 20, and is one of the 20 worst performing hedge funds YTD. Commenting on the move, JPM's Nikolaos Panigirtzoglou said that the low beta that CTAs exhibited to the market recovery of the past two weeks confirms our previous assessment that 1) CTA de-risking had been at the core of the recent market correction and 2) intense CTA de-risking is behind us. Which may be good news for the market, but it is bad for the trend and momentum-chasing community. Indeed, as more performance figures emerge, we can conclude that the quantquake of February was especially destructive for the trend-following community, and specifically the Commodity Trading Advisers (CTA) or managed futures funds, which chase market momentum and which according to the SocGen CTA index, dropped 5.5% in February, their worst month in nearly 17 years, going all the way back to November 2001. 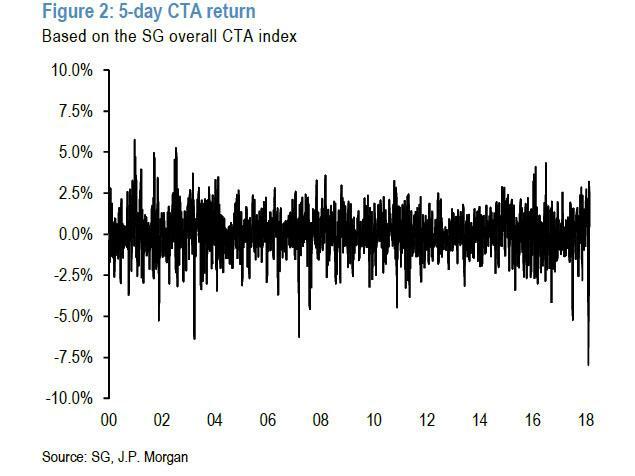 According to JPMorgan, however, for overall CTAs including those outside the Pure-Trend Following category, the loss of 8% in the week ending Feb 8th, "was the worst weekly loss ever recorded since data began in 2000." As the FT adds, the February reversal was so steep that "most quantitative trend-following hedge funds are now in negative territory for the year, with the SocGen CTA index down just over 2 per cent since the start of 2018. February 5 alone was the worst day for CTAs since 2003." Not unexpectedly, despite the carnage, many remain optimistic: the FT cites Marlin Naidoo, global head of capital introductions at Deutsche Bank, who said it was not likely to scare investors away from CTAs. “We don’t think investors who truly understand the strategy are nervous. They may hold off a little before allocating more to the space this year but I’d be surprised if sophisticated investors meaningfully reduce their CTA exposure as a result of February performance,” he said. Mr Naidoo added that in a recent survey conducted by Deutsche Bank, 10 per cent of investors said they planned to add to their investment in CTAs this year. In his latest Flows and Liquidity piece, the JPM strategist writes that "the abrupt de-risking and severe underperformance is raising questions about the future of the CTA universe as it compounds a previous two-year trend of already significant underperformance." 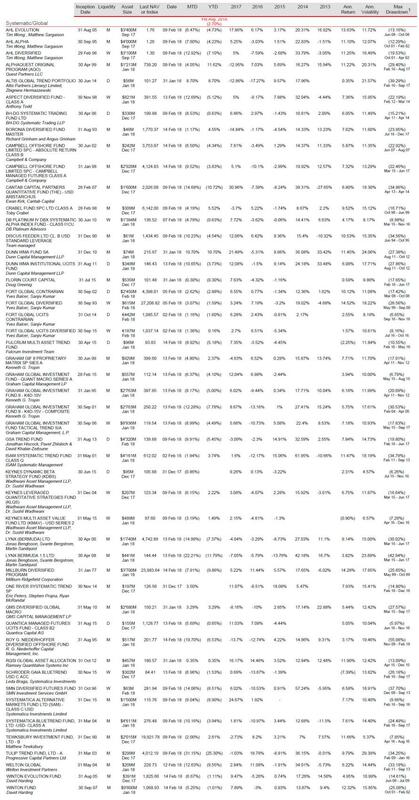 Here he notes that while CTAs have lost -3.7% since January 2016 vs. a positive return of 19.5% for the overall hedge fund universe, what is more troublesome is that the most recent underperformance during February is more problematic for the CTA universe because it casts doubt on the idea that Quant funds such as CTAs exhibit higher convexity and lower beta during market corrections. In our mind, February’s correction shows that CTAs can become victims of even modest profit taking when momentum signals become too strong and momentum positions become too crowded. Recent CTA underperformance creates the risk of institutional investors withdrawing their investments, causing shrinkage of the CTA universe going forward. Not only that, but a wave of redemptions in the CTA community - as investors realize they have none of the upside and all of the downside - may be sufficient to prompt the next leg of the systematic deleveraging/unwind.